More snow overnight and it's still snowing. Mt Roland had a dusting of white this morning. The Dove Lake car park was open to vehicles on Sunday. Thanks for the link, SBS. Excellent. 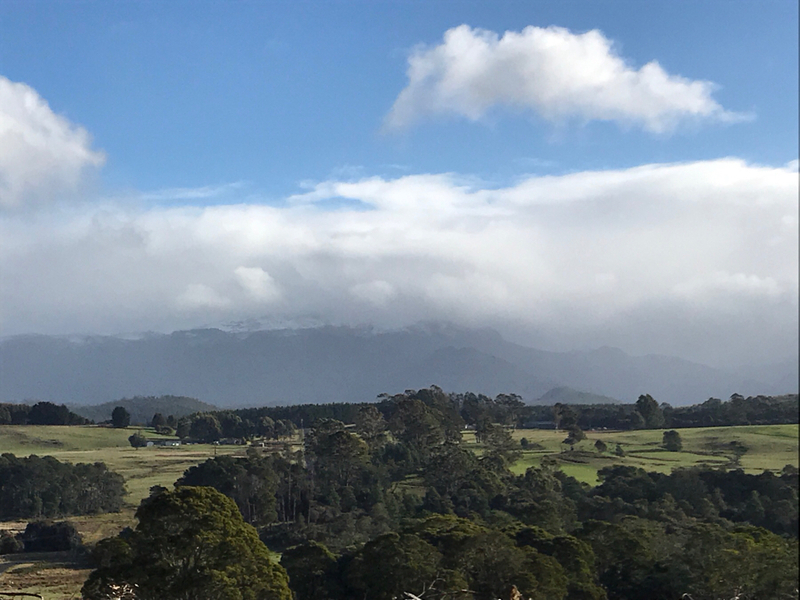 A number of cold fronts crossed the state overnight bringing good snow falls from the West Coast through to Ben Lomond. A Dove Lake web cam photo will follow once the ice is gone from the lens. Last edited by Overlandman on Sat 30 Sep, 2017 5:09 pm, edited 1 time in total. Given that I've just had a snow shower here at home, we can be fairly sure there's plenty of white stuff being dumped on the higher country. The snow settled to below the face track level. Sunshine and rain during the day has dissipated the snow. It will soon melt under the hot sun. My kids enjoyed eating the snow on the Face Track on Sunday! Son of a Beach wrote: My kids enjoyed eating the snow on the Face Track on Sunday! Snow settled on Tasmanian peaks overnight down to the 1300 metre level. Nothing visible on Cradle Mountain as it was covered in cloud till late afternoon. Good to hear, we're heading down to Tassie on Tuesday to escape summer, so am pleased to hear there is snow even though I'm sure it'll have melted by then. Heard on the radio that Snow has settled at Great Lake Hotel also photos and video on Facebook. Last edited by Overlandman on Wed 31 Jan, 2018 10:31 am, edited 2 times in total. An overnight southerly blast has blanketed the Central Plateau with a coat of white. Cradle web cam is down, just had a look at the Cradle Mountain Hotel Facebook page and the area has a blanket of snow. Sunday, 15 April 2018 - 9:38 am. Snow on Black Bluff late this evening and looking like more falling tonight. Snow started settling on the ground at Great Lake Hotel around 3 hours ago. Nothing at Cradle Mountain but may be a different story tomorrow morning. Snow settled on the higher peaks overnight. Peaks around Lake St Clair looked good in white when visible around midday. It was snowing as I was driving through Breona on the way home this afternoon. Snow settled at Cradle Mountain overnight. Snow has settled overnight around Cradle through to Great Lake. Will post a pic when the web cam clears up.